Takagi 2 - the-world-of-the-potss Webseite! 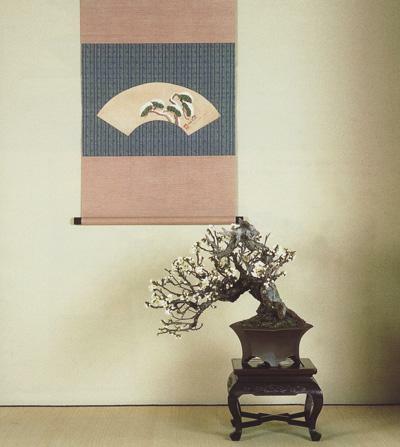 Die Stiftung zur Förderung der Japanischen Bonsaischalenkultur (Stifter ist Herr Takagi) hat im Takagi-Bonsaimuseum Tokio eine Ausstellung von Bonsai in modernen Schalen inszeniert, an der die Erneuerer der Töpferkunst beteiligt waren. Dazu wurden berühmte Bonsaimeister mit eigenen Bäumen und einem traditionellen Begleitelement eingeladen, ihre Bäume in einer Bonsaischale moderner Interpretation zu präsentieren. Die von den Meistern getroffenen Entscheidungen über die Pflanze, insbesondere deren Form und Größe, sind also von den vorgegebenen Schalen bestimmt worden. 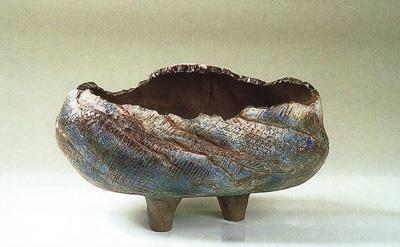 Auf der Jahresausstellung 2006 der Takagi-Stiftung konnten diese Schalen durch ihre Linienführung beeindrucken. 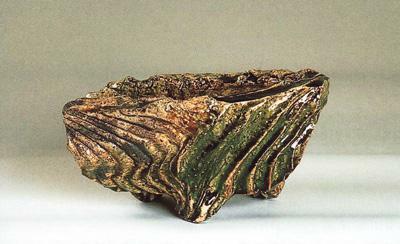 In the bonsai museum of Tokyo, the foundation for the advancement of the japanese bonsai pot culture (the founder is Mr Takagi) staged an exhibition of bonsai in modern pots which was attended by many innovative pottery artists. 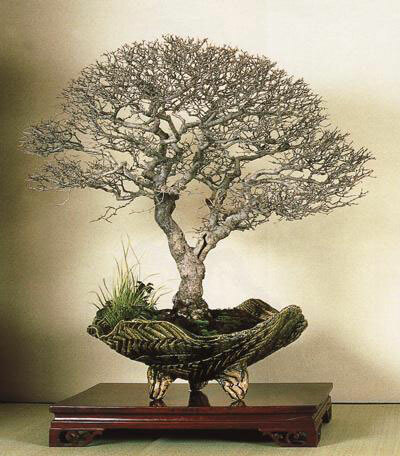 Famous bonsai masters were invited to display their own trees in contemporary pots alongh with traditional accent elements. The decisions of the masters concerning the plant and especially its shape and size were determined by the given pots. 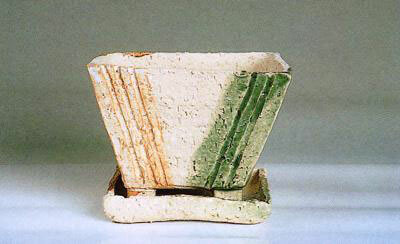 On the yearly exhibition of the Takagi foundation these pots could impress with their design. Jap. Mädchenkiefer (Pinus parviflora), Breite 105 cm. Jap. 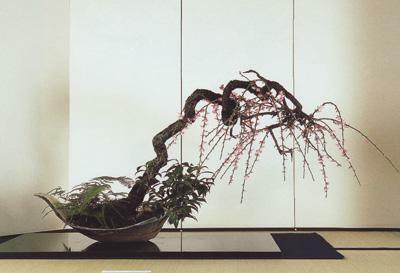 Aprikose (Prunus mume), Breite 31 cm. Originally this specimen grew in a pot three times bigger than this one. The trunk also was three times thicker than it is today. The bonsai has been adapted to the pot by keeping only one branch of the former tree. 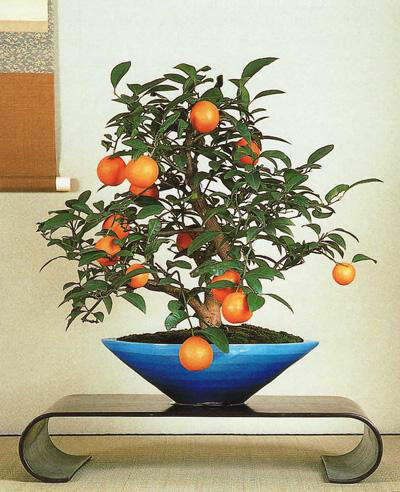 The pot combines well with the apricot tree because its strong trunk hamonizes with the colour and shape. The pot however could easily planted with other species. Considering the season of the exhibition (February) I have decided in favour of a Prunus mume. I wanted to accentuate the contrast between the simple flower, the impressive trunk and the pot. Orange (Citrus sinensis), Höhe 42 cm. 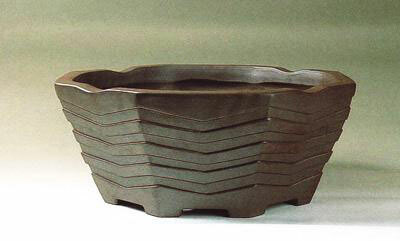 The colour and the modern shape make it a good pot but it is not suitable for classic bonsai. The cold colour suggests water and the image is a landscape at the seaside. In my opinion it es of fundamental importance to suggest a landscape to the viewer. 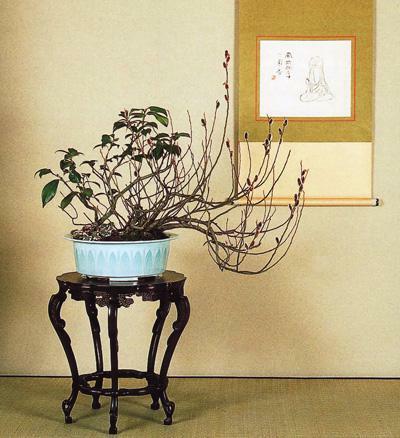 This pot was not easy to combine with a bonsai. 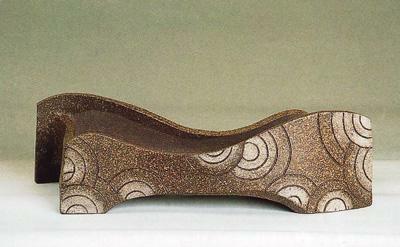 Its free shape with the rim bending outward and small feet makes for a pot with a strong character that can hold only a small amount of soil. First I thougt that only an evergreen tree could fit into such a strong pot. 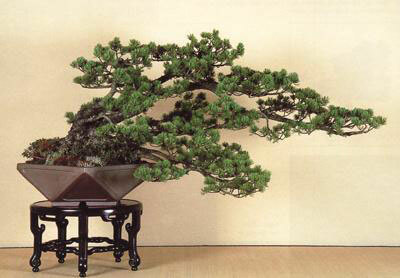 I first tried a bunjin pine because the pot seemed to accentuate a slim trunk better than a strong one. But finally I chose this Camellia japonica in the bunjin style. Its shape and the smooth bark suggest age. The branches must not be too numerous. If they were too young they would not provide enough weight in comparism to the pot. All in all this pot really gave me some trouble. Liguster (Ligustrum optusifolium), Höhe 66 cm. At first I looked at this pot for two weeks and analyzed it. At first its surface reminded me of a lizard's skin, but then I thought I saw the nerves of leaves in it, so that I regarded it as the picture of a bowl filled with leaves. Finally I have chosen a tree that looks old and mature. 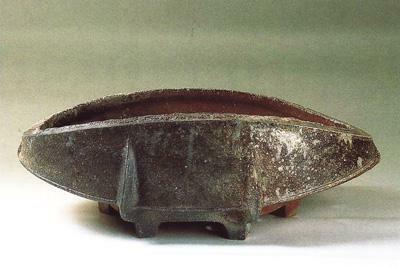 The potter suggested to use the back side of the privet as the viewing side, since this would give a harmonious relation between the movement of the tree and the upper rim of the container. To conceal the high soil level on the left side, a few little grasses were planted. For these two pots I have chosen flowering plants which can be styled to a nice picture in little time. I wanted to illustrate some kind of paradise on earth. Kirsche (Prunus x yedoensis), Breite 90 cm. Die folgenden Schalen wurden noch nicht bepflanzt. In den kommenden Jahren werden andere Bonsaimeister sich bemühen, ein Exemplar zu finden, das zu den ausgezeichneten Schalen passt. Bis dahin müssen wir uns darauf beschränken, uns schöne Kombinationen vorzustellen. The following pots have not been planted yet. In the next years other bonsai masters will try to find trees which suit these excellent pots. Until then we must limit ourselves to just imagining nice combinations. 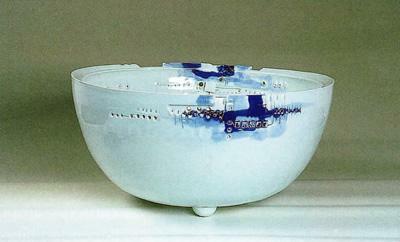 Erster Preis / First prize: Kensaku Kodama. Dieser Artikel und Fotos wurde freundlicherweise von BONSAI ART zur Verfügung gestellt. 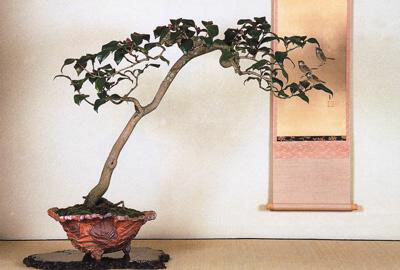 Article and photographs with kind permission of BONSAI ART.